In the Sancin family everyone drives for GoOpti; dad Giuseppe, mum, both daughters Alice and Elisa and their partners. They have always been very close. Before they were dealing with horses, but when dad discovered GoOpti... ''Dad decides to do something and then we all follow him'', said Alice, while dad added: "It was a success to discover GoOpti, which is a perfect organization." Are you curious to learn their secret? How did your 'family' adventure begin with GoOpti? Giuseppe: By pure chance. First, I was dealing with horses! I had a stable with about 50 horses and I was working as a riding instructor. Everyone in the family was involved in the business – my two daughters, Alice and Elisa, also participated in various international championships. But it was not a business with which you could make a living ... Having a carriage, I thought I would start by transporting tourists around the city. When I asked how I could get the appropriate license, I was told I could only get the permission to transport people by car. Well, having no choice, I completed all the courses I needed, I got the license, bought a van and I started a new chapter in my life. After joining the GoOpti network, the business grew even more. Today we have more vans and we all work for GoOpti. Alice, how did you decide to join dad's business and become a professional GoOpti driver? 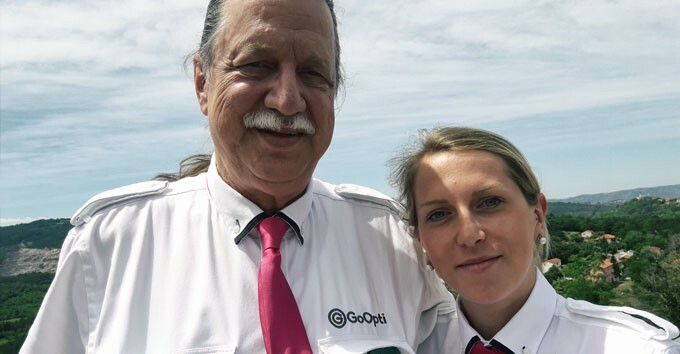 Giuseppe: We recently officially became a GoOpti franchise and this will allow us to grow even more and invite other drivers to work with us. Alice, how do you find yourself as a woman behind the wheel? Do you have any interesting stories to share? Alice: I once went to pick up a lady at the airport. She was very nice and after helping her to put all her luggage in the van, the lady said to me, ''Thank you, dear. Now I will wait for the driver.'' I looked at her and said, ''Ma'am, excuse me. I'm your driver.'' She thought I was there just to help her with her bags. And then she said to me, ''Really? Do you know how to drive?'' ''Yes, don’t worry. I will bring you home'', I replied. In the end, she was very happy and gave me a lot of compliments. Alice: Exactly. One time I happened to have the van full of women and only one man who looked at me and said mockingly, ''Ah, a female driver. Are we sure we’ll be safe?'' I turned around and said, '' Well, let me tell you two things. First of all, I'm very good at driving. So far, I've brought everyone alive to the airport. And second, did you look around?'' All the ladies on board were staring at him and then one of them said, ''Look, the girl has a point. Do you want to get off right away?" Then we all laughed and we proceeded with the journey without any problems. What are the most interesting discoveries you've learned when driving for GoOpti? Valecenter Marconi. Also, the Eden Center near Marco Polo Airport is great. There is also a swimming pool and when I have 3 or 4 hours until the next ride, I take my swimsuit with me and go for a swim. After that I'm fresh and ready to go. Giuseppe: I’ve found out how precious it is to know several languages. For example, I speak Italian, English, Slovenian, Croatian, Serbian and Arabic. I am very fortunate to have had the opportunity to learn so many languages that now help me a lot. Yes, my mom was Slovenian from Bled and my dad was Italian from Trieste Servolano. They met at the University of Ljubljana, where my dad went to study because the university in Trieste was closed during the war. They got married and soon after they had two children. After the war, my father wanted to return to Trieste to work as a GP, but the Italian authorities did not recognize his doctorate. Because he wanted to take care of his young family, my father decided to accept a job offer in Libya, first in Bengasi and then in Tripoli. We stayed there for 14 years!! It is thanks to my mother that I speak Slovenian, Serbian and Croatian, while with my father I spoke Italian and learned English and Arabic in school in Libya. What are the most and the least enjoyable aspects of the job? Alice: The most beautiful thing about being a GoOpti driver is that you meet so many people with many different stories, while the thing that can create problems is the excess baggage. I once had a passenger who wanted to carry a huge plasma! It did not even fit into the van. Giuseppe: It sometimes happens that people order a pickup from their home, but they live in streets where it is impossible to get with a van. Especially in Trieste we have a huge problem with some roads that are extremely narrow, such as Vicolo Scaglioni, Via Fra Pace da Vedano, Scala Santa ... I have listed all of them on my 'black list' (there are about 30) and gave it to all GoOpti drivers who drive in Trieste, so that they can avoid damaging the van as it happened to me. In these cases, we would be very grateful if the passengers warned us in advance. Giuseppe: Grow, invite other drivers to work with us and always offer a great service that meets the needs of our passengers. Alice: As I said, dad decides something .... (laughs) No, I'm joking. I really enjoy doing this job and I am happy that there are more and more people who want to travel with us. Because it's safe, convenient, easy and fun.